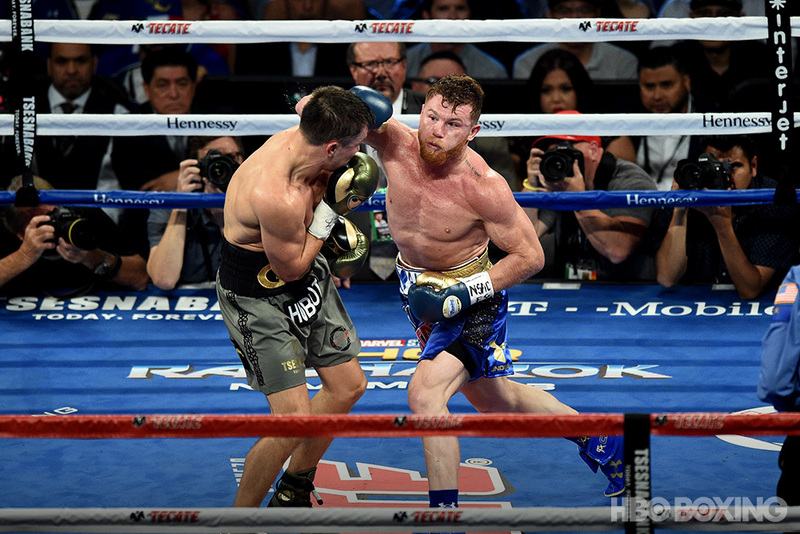 LAS VEGAS – Gennady Golovkin and Canelo Alvarez did everything that was expected of them, and delivered everything that we had hoped that they might. Over twelve highly skilled and hard-fought rounds, the two best middleweights in the world delivered a classic contest that was ultimately – this being boxing – marred by a disgraceful scorecard from judge Adalaide Byrd, who somehow saw fit to award 10 rounds to Alvarez. The ultimate result – a split decision draw – was not a terrible verdict on a close fight, even though most of the 22,358 fans at the T-Mobile Arena felt Golovkin clearly won; but Byrd’s positively larcenous contribution to the evening ensured that there was more than a tinge of distaste and disgust in the air following a fight that deserved only praise. It had taken the best part of two years to get Golovkin (37-0-1, 33 KOs) and Alvarez (49-1-2, 34 KOs) together in the ring, and the long build-up had heightened the anticipation. It had also allowed enough time for what had once been seen as a likely Golovkin win to morph into more of an even-money proposition, with fans and media alike split down the middle as to who would be the likely winner. The fight that unfolded, which had changes in momentum and a clash of styles within individual rounds as well as over the course of the entire bout, justified that widespread uncertainty and equivocation. After a close, slightly tentative opening round, Canelo was the one who settled into his groove first. 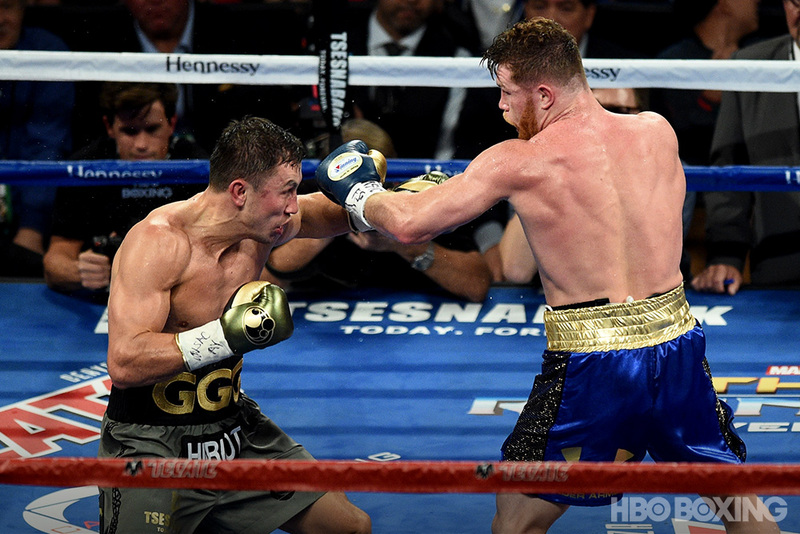 In the second and third round, he was the one who was commanding the distance, Golovkin – perhaps slightly uncertain of how to adjust to Canelo’s excellent head movement – struggling to get into a rhythm and frequently falling short with his punches, allowing Alvarez to land strong counters. The third in particular saw Alvarez in full flow, landing a strong lead hook, a one-two combination and an uppercut as Golovkin plowed forward in straight lines. The Alvarez movement and footwork, often criticized and even derided, saw him circling around the ring on his toes as a leaden-footed Golovkin watched him from ring center. Then, in round four, the script flipped. A short Golovkin right hand looked as if it might have hurt Alvarez, who retreated to the ropes near a neutral corner. As Golovkin saw an opportunity and aimed hard, short, straight blows at Canelo’s head and torso, Alvarez was suddenly not countering. But he shook his head and spread his arms out to signify he was unhurt – dangerous confidence indeed in the face of a Golovkin assault – and even beckoned the Kazakh in. For all his bravado, however, the contest had suddenly become a typical GGG fight: Golovkin was now cutting off the ring and closing the distance, pressuring Alvarez, throwing and throwing and throwing again, keeping his punches short and straight and using them to spear Alvarez to the ropes and in the corner. Canelo’s head movement allowed him to slip many of Golovkin’s big overhand rights – although one booming blow in the fifth would have flattened lesser mortals – but those short, straight power punches behind the constant pressuring jab were now turning the tide strongly in Golovkin’s favor. The CompuBox punch stats show how much busier Golovkin was, especially with the jab: he threw 703 total punches to Canelo’s 505, and 361 jabs to 233 for Alvarez. But the Mexican landed at a higher percentage – connecting with 42 percent of his power shots – and many of those power punches were eye-catching and traveled in wider and more visible arcs than GGG’s frequently less flashy offense. But for three straight rounds, from the fourth through the sixth, Alvarez threw little of any note at all. He looked tired, Golovkin’s constant pressure simply grinding him down. But he pulled out a sudden comeback round in the eighth, landing a strong lead right cross, then digging to the body once, twice, three times. For a period, he was back where he needed to be, in the center of the ring, but then he retreated to the ropes once more and Golovkin resumed his suffocating assault. The man from Guadalajara found himself on the back foot again in the ninth and the fight looked in grave danger of slipping away from him completely, until he somehow found the resolve to fight a desperate rearguard action over the final quarter of the bout, and that was what enabled him to avoid defeat. The tenth was a rousing affair, the best three minutes of the fight: Alvarez appeared to briefly hurt – and certainly moved – Golovkin with a one-two punch combination, only for the Kazakh to respond with a hook. Both men were showing signs of fatigue now, and as they fought in close, they grappled and wrestled as they sought to find angles to throw, and when they were free of each other they just unleashed fury, two-fisted punching temporarily devoid of any strategy, just a pair of warriors battling each other to the last. The eleventh was close, a clearly weary Alvarez throwing punches with far less power than he had been able to muster in the bout’s early stages and yet somehow managing to detonate them directly on Golovkin’s face. Still Golovkin kept moving forward, still he kept throwing punches, but then Alvarez suddenly unleashed an eye-catching counterpunch combination before sliding briefly out the way. The twelfth was fought the way twelfth rounds should be fought in high-stakes battles between the best: as if those three minutes were the dividing lines between victory and defeat, ecstasy and agony, elation and despair. And so in fact they were. The younger Alvarez dug as deep as he had ever dug in his life, somehow finding the final reserves of energy that enabled him to unload at one stage a sequence of four or five punches that landed to Golovkin’s head – several seconds that could conceivably have secured him the final round and thus the draw – and another flush shot before Golovkin appeared to catch and hurt him with a right. The final seconds were a perfect microcosm of much of the bout: Golovkin chasing determinedly, Canelo attempting to fight him off desperately. When the bell rang, fans and media alike stood in unison and applauded a sensational effort. And then the scorecards were read out. That crowd, which had begun as perhaps 60-40 in Canelo’s favor, had decided which man had won and was now cheering the Mexican-style Kazakh over the actual Mexican; and when he was denied the victory they felt he clearly merited, they turned on the former favorite with boos. Their anger was only heightened by Canelo’s defiance. He insisted that Golovkin’s vaunted power was in fact unremarkable – “There wasn’t any power. It didn’t surprise me” – and also that he had been steadily compiling a lead on the scorecards. Golovkin expressed frustration with his opponent’s tactics, but claimed at least some measure of satisfaction from the result.